18MP sensor and full HD movie mode at a keen price - so what is the catch? The Canon EOS 550D is not quite Canon's highest-spec'd consumer digital SLR, but it still packs a mighty punch. The EOS 550D sits just below the EOS 50D and the more professionally orientated EOS 7D in Canon's rather cluttered product line-up, but in some ways it trumps these higher-spec'd cameras. 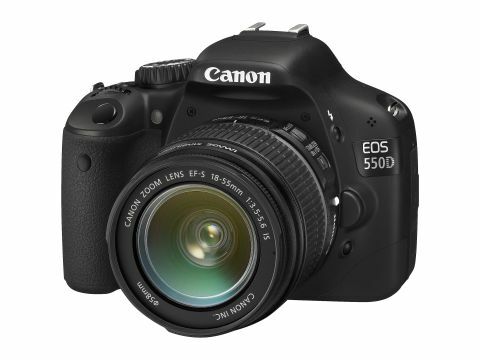 For example, the EOS 550D packs in more megapixels than the EOS 50D (18Mp versus 15.1) and offers more sophisticated HD video features, with the ability to manually control exposure. Of course, Canon is not Father Christmas, so you're not getting an EOS 7D on the cheap here. The 550D lacks the 7D's bullet-proof alloy construction and lags behind in the speed stakes. While the EOS 550D can shoot at 3.7 frames per second in Continuous Shooting Mode, it's restricted to 34 JPEG images, or six RAW files – so sports and action photographers might want to look elsewhere. But don't get us wrong; while the EOS 550D is not a professional-spec SLR, the keen photographer will still get a lot of bang for their buck. This is an ideal DSLR for the serious amateur or somebody wanting to upgrade from an entry level model. The 550D also puts a lot of pressure on Nikon to respond in kind; the Nikon D300s, while a sturdy and impressive stills SLR, lacks the megapixel count and the sophisticated HD movie options of the EOS 550D – and a D300s with kit lens will cost you several hundred quid more than the Canon. Then there's the Nikon D90, but again it's looking a bit dated compared to the EOS 550D. The same goes for the Sony Alpha range, though you can pick up some great Micro Four Thirds hybrids, such as the Olympus PEN E-P2 and the Panasonic Lumix GF1, for a similar price to the 550D. That said, the 550D still appears to have more sophisticated HD video-editing functions than either of these Micro Four Thirds hybrids. Conventional DSLR lenses tend to be cheaper too, and come in more flavours. The feather in the EOS 550D's cap is that it offers full HD mode, rather than just standard HD – 1,920 x 1,080 pixels versus 1,280 x 720. And as you'd expect the EOS 550D works with the full range of EOS lenses. Just as well, as the supplied kit lens is a bit of a let down, but more on this later.